There’s a theme running through all of our art offerings this season: audience interaction. Our painting project was no exception, and last Thursday we invited our subscribers and the public to come see ‘M’, a fully touchable, changeable painting series, with 13,841,287,201 possible permutations. Yeah, you read that right: 13,841,287,201. This thought process created ‘M’, a 49-piece grid of paintings designed to be changed and manipulated by viewers. 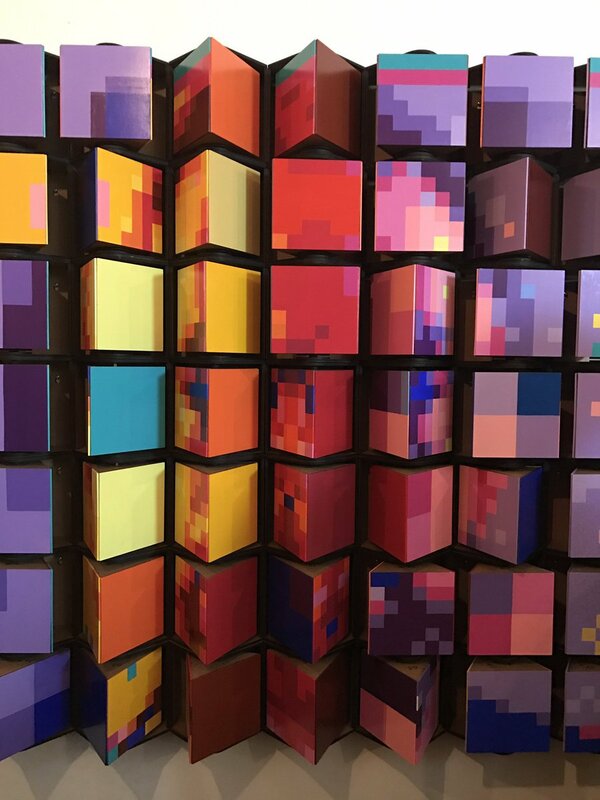 Each small painting is in fact a ‘pixel box’, a pyramid-shaped block that rotates inside of a box structure, providing 3 small canvasses for Mark to paint. 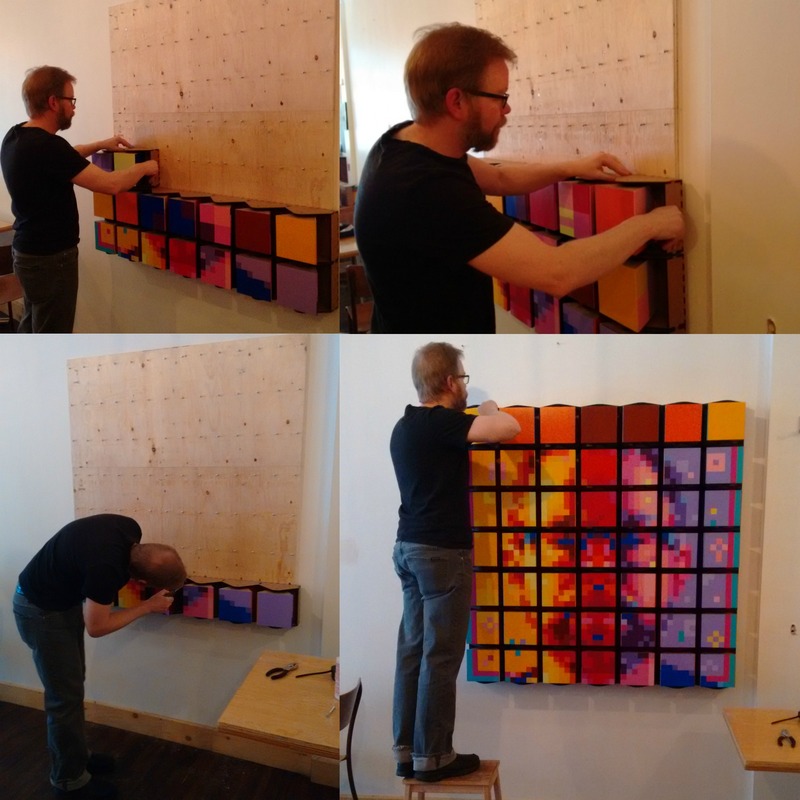 The pixel boxes were conceived and created by Mark, using a laser-cutter at the Ottawa Public Library’s Imagine Space. Hung together, the 49 pixel boxes create three full self-portraits that play with the concept of pixels, moving from lower to higher picture resolutions. 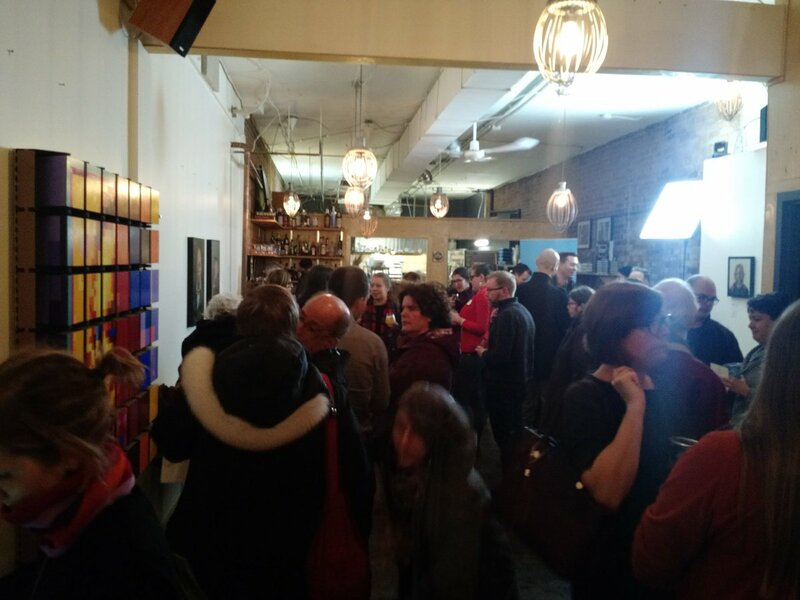 On February 16th patrons were invited to Clover Food & Drink to play with the piece for the first time, discovering the three self-portraits as well as some of the other 13,841,287,198 possibilities. Thirteen billion is a lot to discover, so help us out by visiting ‘M’ at Clover (155 Bank Street) between now and March 31st! After that the work will be dismantled, and the pixel boxes distributed to CSArt subscribers. Each piece will exist as its own separate abstract work, and as a memory of the larger piece and the communal experience. For more of Mark’s projects, visit http://www.markbstephenson.com.